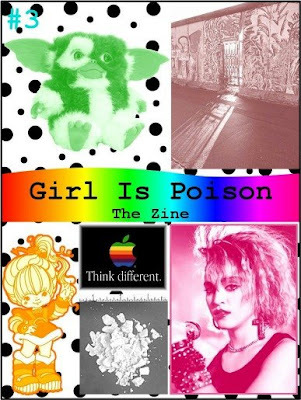 Girl Is Poison: Issue #3: The 80's! What can trigger such hatred in people to this day than the behavour of Madonna. My ex-wife hated her, my co-worker Brian is disgusted with her, but I still think she is hot hot hot. Great post and your followers are growing... I am glad you're here.... seee ya! Hi how are you I just wanted to stop by and thank you for your blog friendship and to wish you a happy holiday weekend. I set up two awards for you on my blog. The first one is called "Uber Amazing Blog" and the second one is the "Kreativ Blogger" award. Please feel free to also pass them along to any blogger friends you may have or to simply display them on your blog like I want you to. Take and and click here to get you there quick. so... where do i get a copy of the 80's issue? There is no denying the awesomeness that was the 80's! I worshiped Jem, my hair was always crimped, & my swatch phone was practically fused to my head. I must see your 80's issue! I hope to make the 80's eternal...lol. Very nice issue, Lux!